Building Automation (BA) is used for creating plant and control schemes. 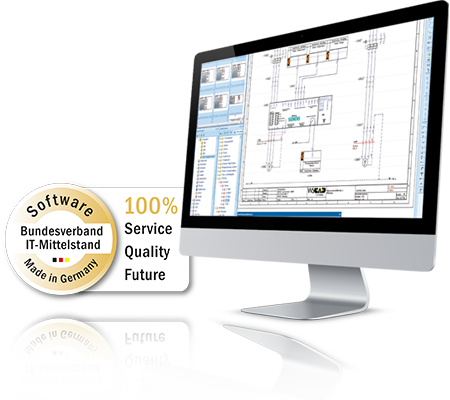 Function lists are structured according to the guidelines VDI 3814 and 3813 for the entire building automation. The symbols placed in a schema are stored with concrete products and related manufacturer data from the supplied extensive database or from wscaduniverse.com. This, in turn, serves as the basis for materials and parts lists and is used for the procurement of materials and price determination. Extensive symbol and macro libraries and Materials and Data Point Browsers enable rapid processing and simplify the workflow considerably. The integrated data point and signal management allows for easy management of all objects, signals and functions. Plug-ins enable automatic plant and address labeling – starting with an identification of the building, through structure identification, down to signal labeling. Since the CAD/PDF data of external plans from other subsections of technical building equipment such as heating, ventilation, refrigeration and electrical engineering can be easily imported, these preliminary inputs can be used as a basis for further efficient planning, while also saving a significant amount of time.